Developed by Henry Beechem in St. Johns, Michigan, to meet the high level of quality demanded by dedicated craftsmen. Manufactured in Shelby,Michigan, since 1985 by Kelley Laboratories, Inc.
Now in our second generation and we love making Beechem products! 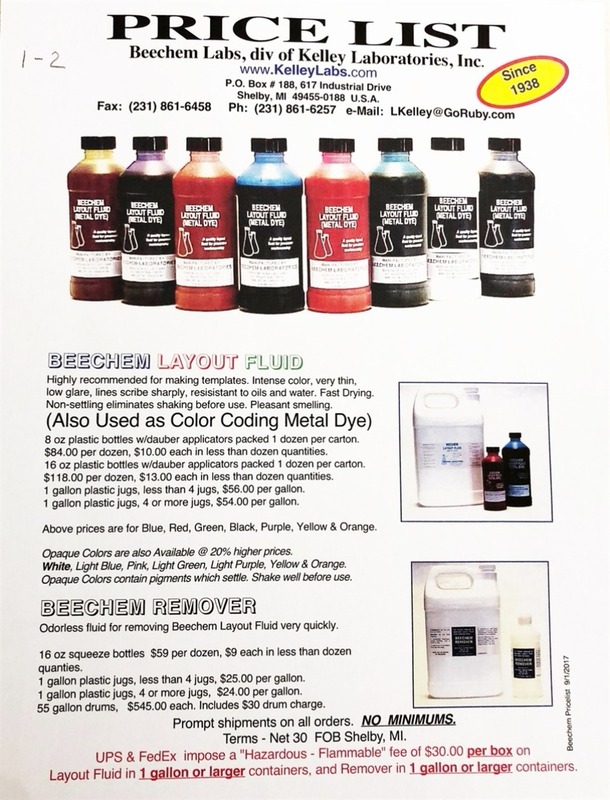 Beechem Layout Fluid is Better than Dykem!!! Works great for color coding for small parts Beechem is used in making chain saws, engines, tractors, automobiles, even nuclear power plants! Quickly removes Layout Fluid with no odor, packaged in gallons and squirt top bottles. Easily removed with cold water with or without detergent. Will not rust steel or iron - ever! and you're welcome to contact us to set up an open account with Net 30 terms.